Rodolfo Rodriguez, 92, was struck with a brick and beaten July 4, 2018 in Willowbrook. 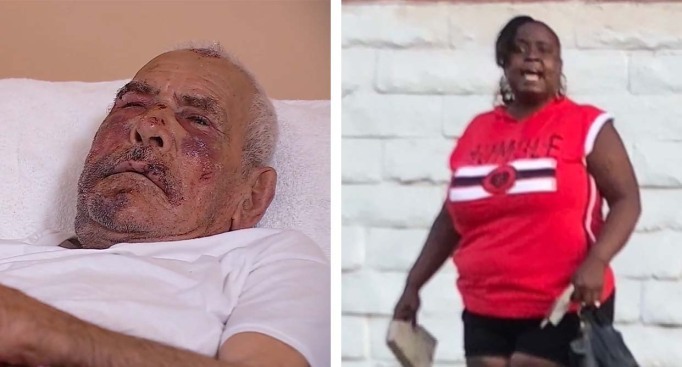 A woman was charged with attempted murder Thursday in an attack on a 92-year-old man who was struck with a concrete brick and berated on a Southern California sidewalk. Laquisha Jones, 30, of Los Angeles, was arrested Tuesday night near 60th Street and Crenshaw Avenue in the Willowbrook area of Los Angeles, according to a statement from the Los Angeles County Sheriff's Department. She faces charges of attempted murder and elder abuse, infliction of injury. Jones pleaded not guilty Thursday afternoon in the Compton courthouse. Prosecutors had planned to ask that bail be set at $1.1 million. She faces a maximum of 29 years in state prison. The attack on Rodolfo Rodriguez occurred about 7:30 p.m. on the Fourth of July in the area of East 118th and Robin streets. Video of the aftermath, captured by a witness who called 911, showed Rodriguez on the ground with a bloodied face. 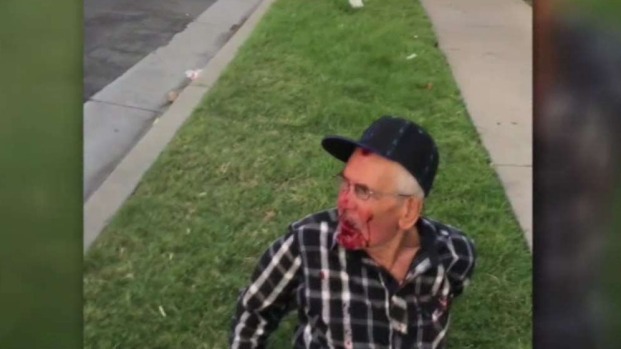 A 92-year-old out for his daily walk Wednesday was assaulted by a woman and a group of men, he and his family say. John Cádiz Klemack reports for the NBC4 News at 6 p.m. on Friday, July 6, 2018. A motive for the attack was not immediately clear, investigators said. Rodriguez was going for a walk in his neighborhood when he encountered the assailant. Once he was on the ground, a group of men started kicking him, the witness said. The female attacker told Rodriguez, a U.S. resident who is from Mexico, to "go back, go back" and cursed at him, according to the witness. In an interview Tuesday with NBC News, the witness said she believes the woman was telling Rodriguez to "go back" to Mexico. In a statement Wednesday afternoon, Los Angeles County Sheriff's investigators said the crime is not a "hate-related incident." "Who would do this to anybody? A 92-year-old senior citizen," said Erik Mendoza, the victim's grandson. "What can he do to anybody? There's no harm that he meant." In the witness video, a woman wearing a red shirt who was walking with a child can be seen holding what appears to be a piece of concrete. The felony complaint filed Thursday includes a special allegation that the defendant used a deadly and dangerous weapon -- the piece of concrete. Jones left the scene, but was taken into custody Tuesday without incident, according to the sheriff's department. It was not immediately clear whether Jones has an attorney. Investigators are still attempting to determine whether there were more individuals involved in the attack. Rodriguez was released from the hospital to recover from his injuries at home with his family. "Mr. Rodriguez is slowly recovering from this senseless and brutal assault. His family is appreciative of the community’s outpouring of support and concern about his condition."